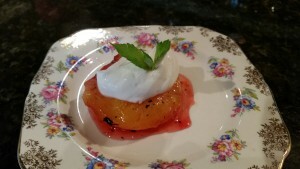 At the 1802 House, we serve a fruit course with our breakfasts every morning. We serve it in between the fresh baked muffins and follow it up with an entree. As you can imagine, it’s a challenge to find something that’s not too heavy and filling. I had seen a recipe for roast plums with thyme, but thought that Earl Grey Tea would be a more interesting flavor combination. 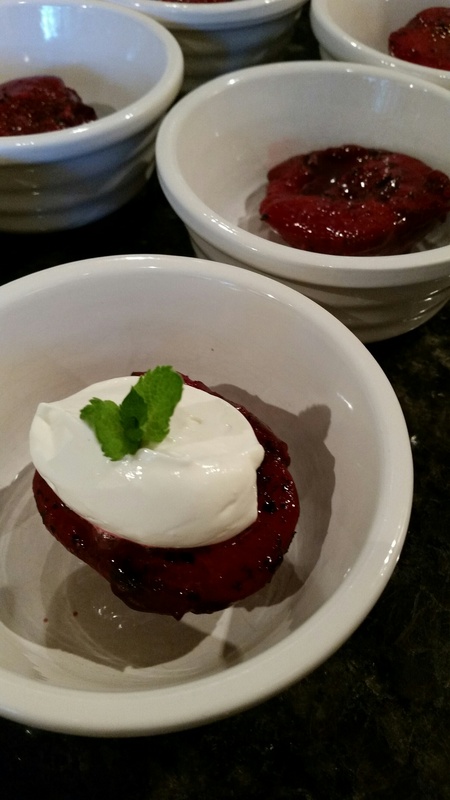 We try to use the black plums as I like the richness of the dark purple syrup with the creamy smooth lightly sweetened Greek Yogurt. When those aren’t available, the regular plums work just fine. This dish is a little tart and a little sweet with just a hint of that fragrant tea. Guests really enjoy this one! Place a sheet of parchment paper on a baking tray. Drizzle the honey over the parchment and then sprinkle the sugar on top. Crush the loose leaf tea with your fingers or a mortar and pestle and sprinkle over the honey and sugar. You should have firm plums that are not too ripe so that they hold their shape when roasted. Cut the plums in half and gently twist apart. Using a sharp knife, cut around the stone to remove. 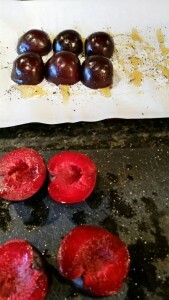 Place the plums cut side down on the parchment paper over the honey, sugar and tea. Bake in a preheated 375F oven for 20 minutes. 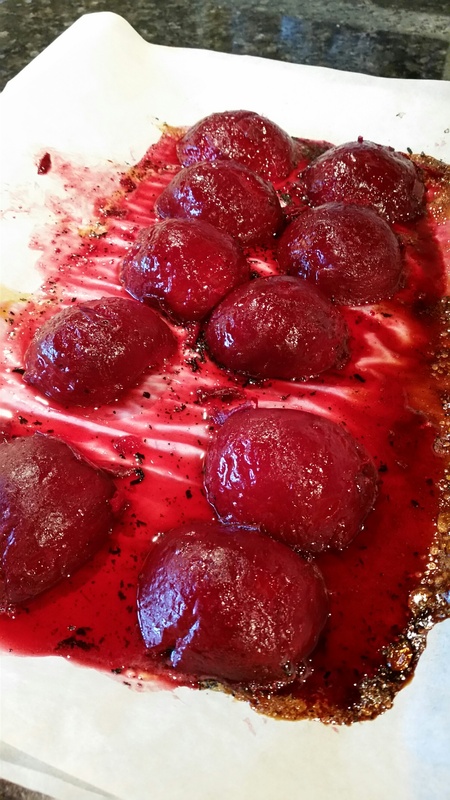 The plums should retain their shape when you remove from the oven and the honey and sugar will have formed a beautiful dark purple syrup. Keep a watch on them to make sure they don't overcook. Remove plums from oven. Gently peel away the skins being careful not to burn yourself. Some of the skins pull away easily, others have to be gently peeled back. The skins are tough and bitter so it's worth taking the time to do this. To serve, place a half a plum on a small dish and drizzle a little of the syrup on top. Let come to room temperature and serve with a small dollop of Greek Yogurt that's been lightly sweetened with Agave. Place a mint leaf on top and ENJOY!